湖泊科学 2016, Vol. 28 Issue (1): 132-140. DOI: 10.18307/2016.0115. 卢慧斌, 陈光杰, 蔡燕凤, 王教元, 陈小林, 段立曾, 张虎才, 近百年来枝角类群落响应洱海营养水平、外来鱼类引入以及水生植被变化的特征. 湖泊科学, 2016, 28(1): 132-140. DOI: 10.18307/2016.0115. LU Huibin, CHEN Guangjie, CAI Yanfeng, WANG Jiaoyuan, CHEN Xiaolin, DUAN Lizeng, ZHANG Hucai. Cladoceran community responses to eutrophication, fish introduction and macrophyte degradation over the past century in Lake Erhai. Journal of Lake Sciences, 2016, 28(1): 132-140. DOI: 10.18307/2016.0115. 摘要：近几十年来, 以大型湖泊为代表的云南部分湖泊受人类活动的持续影响出现了生态环境的明显变化.洱海作为云南面积第2大淡水湖泊, 经历了多重环境压力(富营养化、外来鱼类引入、水生植被退化等)的影响.在湖泊现代监测数据面临时段较短、缺乏连续记录的背景下, 湖泊沉积物的连续记录可以提供湖泊生态环境变化的长期历史并可用于生态响应模式的识别.以目前处于富营养水平的洱海为研究对象, 应用湖泊沉积物记录进行多指标分析, 探讨多重环境压力影响下洱海枝角类群落的长期变化特征以及影响因素, 并与已有研究成果和现代监测数据进行对比, 探讨了枝角类群落对环境压力响应的空间差异性.通过分析沉积物枝角类记录, 重建了近百年来洱海枝角类群落的变化历史, 结果表明过去100年来, 枝角类的生物量总体呈增加趋势, 尤其从1990年左右开始, 象鼻溞生物量显著增加, 物种相对组成出现明显变化(如Bosmina longispina被B. longirostris取代).同时象鼻溞的生物量、壳长与触角长度在1990s初期有明显降低的趋势, 与同期外来鱼类(如银鱼)引种成功的时间一致.限制性聚类分析结果表明, 枝角类群落结构的变化有3个主要阶段:1990s以前, 底栖枝角类为群落的主要组成; 19902000年左右, 浮游枝角类(以象鼻溞为主)在枝角类群落结构中的比例迅速增加; 从2000年以后, 枝角类群落组成以浮游枝角类为主.同时, 枝角类数据的主成分(PCA)分析显示, 仅有PCA主轴1呈现显著的变化且解释了群落结构变化的61.64%, 进一步分析表明水生植被变化可能是驱动枝角类变化的主要环境梯度, 如底栖枝角类生物量减少响应了湖泊水生植被的退化.与已有研究对比表明, 浅水湖区沉积物记录的枝角类生物量在1970s急剧增加与1980s急剧降低等现象并没有被深水区的沉积物记录所反映, 指示了洱海生态系统的变化模式存在空间差异性.同时象鼻溞个体大小的变化模式反映了外来鱼类引入导致的鱼类捕食压力的变化.总之, 本文揭示了枝角类群落结构与生物量的长期变化, 反映了洱海富营养化过程、水生植被的退化与外来鱼类引入的长期驱动影响, 因此对洱海的生态管理与修复工作应考虑多个环境压力的影响并加强对湖泊生态系统的评价. Abstract: Obvious environment changes have occurred in some lakes of Yunnan Province due to intensifying human impacts over the past decades, especially in large lakes. Lake Erhai is the second largest lake in the Yunnan by surface area, which experienced the pressures of multiple environmental stressors (e.g. eutrophication, fish invasion and macrophyte degradation). 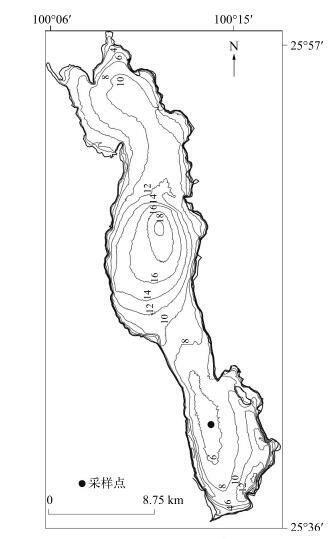 The application of lake sediment records enables us to reconstruct the long-term changes of lake environment and ecosystem dynamics in situation of less monitoring data. Here multi-proxy analyses of lake sediments were conducted from a short sediment core in the south and shallow basin of Lake Erhai, which are currently eutrophic. We aimed to recognize the long-term variations and driving factors of cladoceran community, and to test for whether spatial heterogeneity exists in community responses through a comparison with monitoring data and previous results from the deep basin of Lake Erhai. Our results showed that cladoceran production showed an overall increasing trend in the past century, and since 1990s bosminid production increased significantly with a general trend of the oligotrophic taxon of Bosmina longispina replaced by B. longirostris. In addition, bosminid production and the body size (i.e. carapace and antennule length) displayed a decrease during early 1990s, were in good correspondence with the period when the population of the exotic noodlefish was well established. Based on the constrained cluster analysis, the historical changes of cladoceran community were characterized by three distinct phases:littoral cladocerans were dominant before the 1990s and the relative abundance of pelagic cladocerans increased rapidly from the 1990s before the pelagic cladocerans became predominant during early 2000s. The principal component analysis showed that the environmental gradient associated with macrophyte coverage accounted for 61.64% of the total variance in the cladoceran community. Compared with previous studies, we observed that the increased production of cladocerans during the 1970s and an abrupt decrease during the 1980s recorded in shallow basin of Lake Erhai were not reflected in the core from the deep basin, indicating that spatial heterogeneity exists in ecosystem changes of Lake Erhai. We also found the obvious shift of bosminid body sizes in response to fish introduction. Overall, our results revealed the long-term changes of cladoceran production and community structure mainly as a consequence of lake eutrophication and macrophyte degradation, while fish introduction also played a role in structuring zooplankton community through changing predation pressure. Therefore the environmental stressors which could be identified through sedimentary records should be taken into account for sustainable management and ecological restoration of Lake Erhai through facilitating lake ecosystem assessment. 沉积物枝角类样品的处理参照Korhola等的方法.首先将冻干的样品充分混合均匀，称取约0.1g(干重)样品，倒入100ml烧杯中；再加入50ml的10% KOH溶液，并在电热板上加热到70℃左右约30min，期间用玻璃棒轻轻搅拌，以使样品充分解絮凝；然后用38μm的筛网过滤，再用蒸馏水将筛网上的样品清洗到带有刻度的15ml离心管中，加入3滴95%的乙醇用于样品的室温保存，并定容.再将样品充分摇匀，利用0.05ml的移液枪吸取样品溶液，置于载玻片上，在电热板上以50℃加热，在样品蒸发待干前，加入两滴甘油-藏红染料，用针轻轻搅拌使其混合并均匀分布，将盖玻片置于其上，待其冷却后用指甲油密封盖玻片的边缘以便长期保存.枝角类的鉴定与计数在莱卡显微镜(LeicaDM2500)下进行，依据Frey[9-11]、Goulden等的鉴定标准，盘肠溞科的枝角类鉴定到种的水平，其中Alona spp.为A.rectangula、A.guttata与A.costata的合并，基于象鼻溞的头孔将其分为Bosmina longispina与B. longirostris两个种，溞科的枝角类基于其尾爪分为Daphnia longispina与D. pulex两个群组，Daphnia为两个群组的合并.同时统计头壳、壳瓣、后腹部的个数以确定个体的数量，每个样品中枝角类的计数不少于100个，最后换算成通量(每平方厘米每年沉积的枝角类个体数量)作为生物量的指标.并测量玻片中所见象鼻溞的第一触角长度(AL)、壳长(CL)与刺长(ML)，每个样品中象鼻溞不同部位的测量样本个数不低于10. 在枝角类群落结构PCA分析结果基础上，运用Broken-Stick模型对PCA主轴的显著性进行检验发现，能显著解释湖区枝角类群落结构变化的仅有PCA主轴1，共解释了群落变化方差的61.64%.沿PCA轴1负方向变化的枝角类为浮游的B.longispina与B.longirostris，而沿PCA轴1正方向变化的为枝角类底栖属种，如Alona affinis、Acroperus harpae、Graptoleberis testudinaria等，以及半浮游物种Chydorus sphaericus(图 6). 洱海沉积物氮含量的变化(图 7)反映了洱海缓慢的富营养化过程，枝角类生物量总体增加的趋势与这一过程相对应，但是存在较大波动，可能反映了不同时期人类活动类型与强度的变化.例如，1970s枝角类生物量的急剧增加与西洱河水电站的修建使得洱海水位下降这一事件相一致.湖泊水位的下降促进水草空间分布的变化，南部湖底平坦的湖区水深相对较浅，水草生长茂盛，有利于底栖枝角类生境的增加.然而，1980s以后枝角类生物量的显著降低，与吴庆龙等调查发现的洱海水生高等植被在1980s以后的衰退相一致.特别是洱海网箱养鱼的大力开展，对水草资源的破坏性开发，使得底栖枝角类赖以生存的环境遭到破坏，对枝角类生物量产生抑制作用.从1990s以后，底栖枝角类逐渐衰退，浮游的象鼻溞成为枝角类的重要组成部分.而Liu等对洱海中部沉积物中的枝角类群落的研究并没有发现枝角类生物量在1970s急剧增加与1980s急剧降低的事件，可能反映了浅水区生物群落对湖泊水位下降的响应比深水区更为敏感，指示了生物群落在湖泊不同水深出现的差异性响应现象.本文的研究结果与Liu等识别的1990s以后枝角类生物量的增加，特别是象鼻溞相对丰度的急剧增加是一致的.然而，Chydorus sphaericus在Liu的研究中作为湖泊富营养化的指示物种，在1990s以后生物量显著增加，这与我们的研究结果是不同的.Duigan在对Chydorus sphaericus的研究中发现，该种不仅出现在贫营养的水体中，也经常在湖泊与池塘沿岸区的大型植被床中被发现，还在蓝绿藻水华出现的地点以及高水位水体的沉水植被中被发现.这说明Chydorus sphaericus生活的生境广泛，其在洱海南部的变化特征与水生植被的退化趋势相一致，同时也可能受到水体营养水平、水位变化的协同影响. 本文的研究结果表明洱海在近百年来经历了多重环境压力的胁迫.特别是1970s以来，富营养化趋势增强、水质恶化、水位剧烈波动、水生植被退化、鱼类群落组成变动大等，这些因素都会对枝角类群落结构产生重要影响[1-2].现代调查数据显示洱海的水生植被在过去几十年出现了明显变化.水生高等植物在1950s-1980s呈扩展趋势，而从1980s开始趋于衰退，不仅种类组成与群落类型减少，分布面积更是大为缩减.导致水生植被退化的原因有多种，无论是水体中氮、磷营养盐对水生植物的胁迫，还是透明度、气温、水位变化以及食物网消费者结构改变等因素都会对水生植物生长产生直接或间接的影响，水生植被在洱海呈现长期退化的趋势(图 7).而我们发现水生植被的退化所造成的底栖枝角类群落生境的丧失，可能导致了枝角类群落结构的改变.从对枝角类群落PCA分析的结果来看，只有第一个主轴显著且解释了枝角类群落结构变化的61.64%.从沿PCA主轴1两个方向变化的物种来看，呈现底栖枝角类逐渐被象鼻溞等浮游类型取代的趋势.样品点在PCA主轴1上的得分与底栖枝角类比例的变化显著相关(r=0.9957，n=27，P＜0.001)，其在1980年以后的急剧变化(图 7)与同期底栖枝角类生物量的迅速下降(图 3)同步，可以看出枝角类群落结构的长期变化主要是由底栖枝角类群落的变化导致的.水生植被覆盖面积在这一时期的显著减小，表明底栖枝角类赖以生存的环境的丧失.生境的丧失导致底栖枝角类群落的生物量以及比例急剧下降.而这一时期指示湖泊营养水平的沉积物总氮含量增加的趋势并不明显，浮游枝角类生物量在这一时期增加幅度也较小，所以不可能是增加的浮游枝角类生物量对底栖枝角类生物量的稀释作用造成的底栖枝角类比例相对减小.从1995年以后，沉积物总氮含量显著增加，水体中总磷的监测值也同步增加(图 7)，同时浮游枝角类的生物量大幅增加(图 3)，可能造成了枝角类群落结构的改变.因此，枝角类群落结构的显著变化主要反映了水生植被的快速变化，而富营养化的过程也可能影响枝角类群落结构的变化. Smol JP. Pollution of lakes and rivers:a paleoenvironmental perspective. New Jersey: John Wiley & Sons, 2008. Korhola A, Rautio M. Cladoceran and other branchiopod crustaceans. Dordrecht:Springer Netherlands, 2001, 5-41. Smol JP. The power of the past:using sediments to track the effects of multiple stressors on lake ecosystems. Freshwater Biology, 2010, 55(s1): 43-59. 王苏民, 窦鸿身. 中国湖泊志. 北京: 科学出版社, 1998, 371-374. Frey DG. The late-glacial cladoceran fauna of a small lake. Archiv für Hydrobiologie, 1958, 54: 209-275. Frey DG. Cladoceran from the Eemian Interglacial of Denmark. Journal of Paleontology, 1962, 36: 1133-1154. 朱芸, 雷国良, 林燕语等. 元素分析仪-同位素质谱测定全氮含量的方法研究. 福建师范大学:自然科学版, 2013, 29(1): 58-62. 董云仙, 谢建平, 董云生等. 洱海水生植被资源及其可持续利用途径. 生态经济, 1996(5): 15-19.